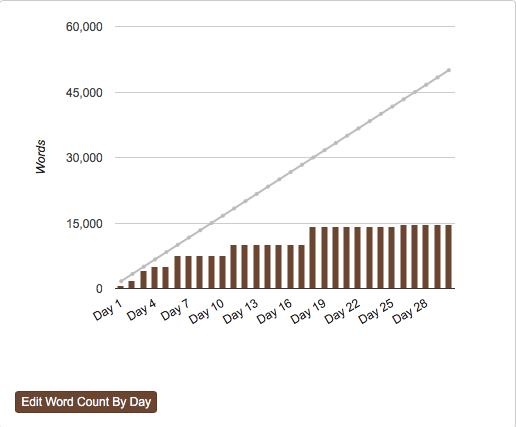 I figured that I would start this post with a picture of what my word count looked like this NaNoWriMo. Not impressive I know. But underneath the never really meeting the work count goal, I am super impressed with myself. My goal for this NaNoWriMo was never to reach 50k. Instead it was to improve the 30k novel I wrote last year, and if I achieved the goal of 50k along the way then hell yea that would be fantastic. I achieved the kind of quality that I wanted for my book, something that I am super proud of and eventually (when I am finished with the book) be able to give it to my best friend to read and comment on. I also had extremely important exams this past month that would help me get into university. So once again, 50k would have been unachievable if I wanted to do as well as I could in my exams. I loved how that even though I didn't write everyday and I didn't achieve the 50k word count, I was able to develop some kind of routine of writing everyday. This routine has set me up for December where I will be doing most of my writing and editing. So who is with me for a #50kin December kind of month? If you participated in NaNoWriMo, feel free to share your experience down below! I would love to hear it!